For Fabio, his desire was the Tudor. “Most prefer the coupe for the chopped look. When you chop a Tudor body, the roof has more of a bubble look which I prefer. Business coupes have a shorter roof and a longer boot.” Fab’s requirement was that it was to be “a two door, Tudor body, twin spinner!” A man who knows what he wants! With customising hitting the sixties hard and continuing well into the present day, many a spinner has succumbed the unforgiving flame of the gas axe and welder thus leaving the market sparse of these sort after classics and Fabio had to do his fair share of hunting to locate a good one. In 2011, He finally landed the Spinner in the style and colour he was after. As an unrestored machine bar a paint job, she wasn’t in too bad a condition thanks to the care of the previous owner who happened to be a car detailer by trade. 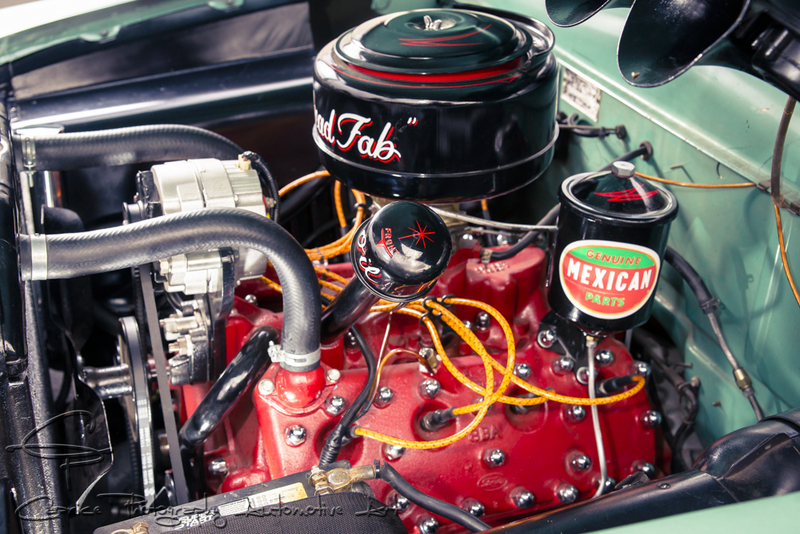 With his stock custom on Aussie soil, it was time for Fab to customise the flathead Ford to his own liking. Unfortunately, this is where the story and Fab’s experience takes a turn for the worst! Having entrusted the work to a “professional” business, the car sat idle in the corner for two years before fab had to count his loses and take back the untouched machine! This left a nasty taste in his mouth but with good friends around, all is not lost. By banding together, each with their respected skills, Fab’s mates were able to modify the lean green machine into its Mexican guise! The 239 ci flathead motor had seen better days and was due for a freshen up. Fab’s good friend, Danny Gigs of Gigs Performance went to work building a new heart beat for the old girl. “He’s a gun!” remarked Fab. The rebuilt motor received a mild cam for extra kick while all other parts were either rebuilt or replaced as required. “She’s Just a cruiser. I wanted it to be reliable. Once you start mucking around with flatheads, you got to go all out or nothing.” Exhaust headers and mandrel bent stainless pipes lets you know she’s a V8 courtesy of another good friend, Daniel Kelly. 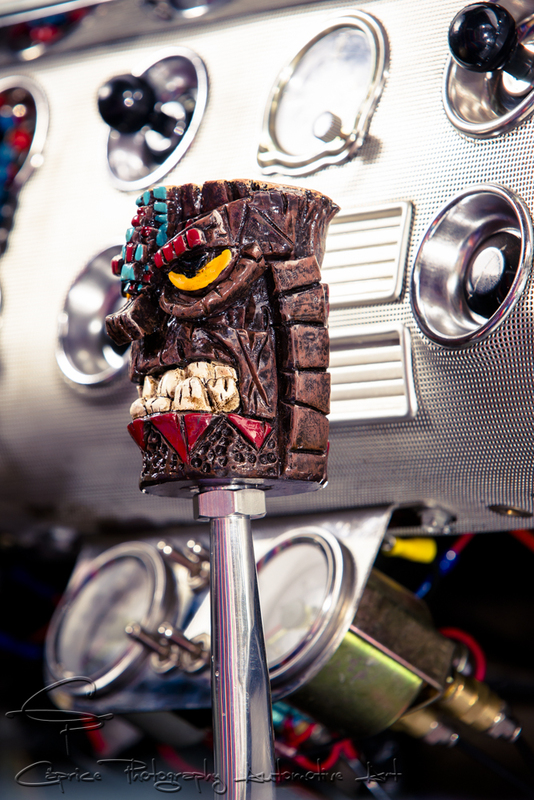 While the stock spinner came with the “three on the tree”, Fab opted for a C10 auto with a tall B&M shifter topped off with an evil tiki head thanks to exhaust man, Daniel Kelly. The diff remains the original item. The belly scraping stance comes courtesy of some died in the wool customising performed by a number of contributors. Once again, Danny Gigs can own the C notched chassis, 4 link suspension and front drop spindles as well as the sheet metal modifications to the rear floor and boot. These sections had to be raised as did all four inner guards to allow the stock 15 inch rims and white wall tires to disappear under the wide arched wheel arches of the twin Spinner. A set of Starburst caps finish dressing up the wheels. 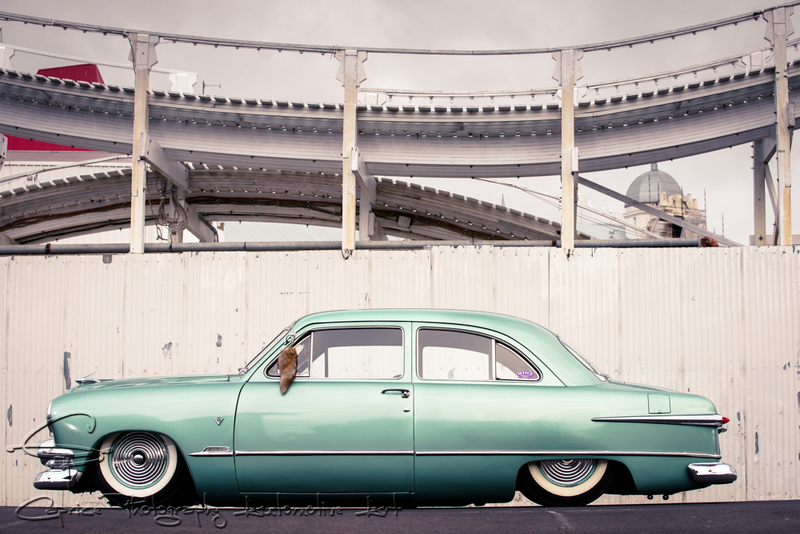 Leon Davies from Big L’s Chop Shop got the nod for the Air Ride suspension installation. With a bag in each corner, twin compressors, a sway bar for stability and the cross member resting on the ground when down, Leon’s work was done! 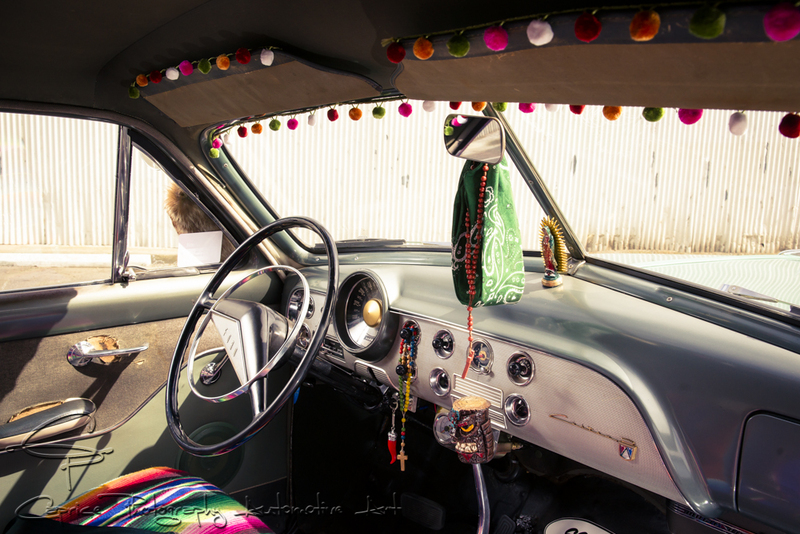 The interior retains the sparse Mexican style as can be found around East LA with a couple of vibrant Mexican blankets covering the seats, bare floors and doors and dangling Mexican pompoms, traditional bandana and religious paraphernalia completing the south of the border theme. Regardless of the trials and tribulations Fab has gone through, or maybe because of, this twin spinner custom is a keeper. “I’ll never get rid of her” he says. “Not after what we went through. Love it. I’m really enjoying it and so is the family. We cruise to heaps of shows now.” This scene is not just about our cars but also about the family and friends we have around us and support us. Fabio would also like to thank Sam Candia, Jamie McHugh and Lou Tenace for their assistance throughout the build. If you want to receive regular posts of future events, cars and other automotive articles of interest, click the follow button on the blog page! “Spinner” is what Aussie’s call them. 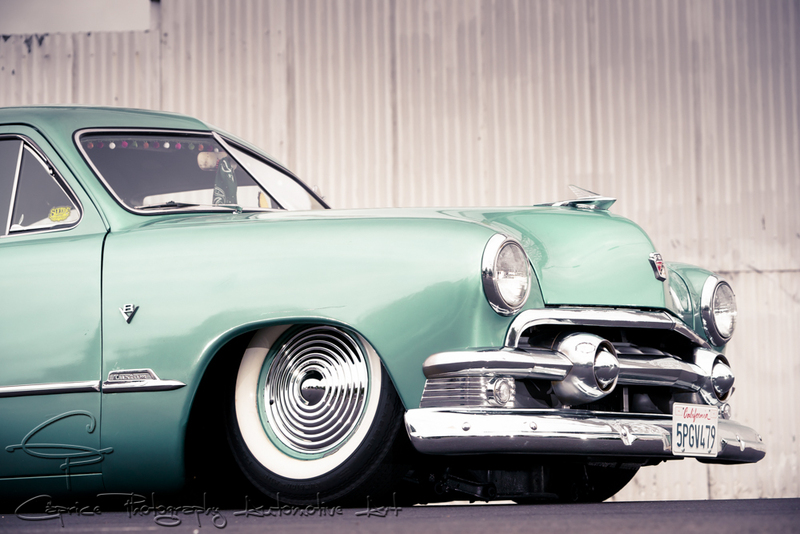 They were always known as the shoebox Ford in the US. Cheers Tony! Yep, we definitely have our own lingo when it comes to naming cars or car parts!